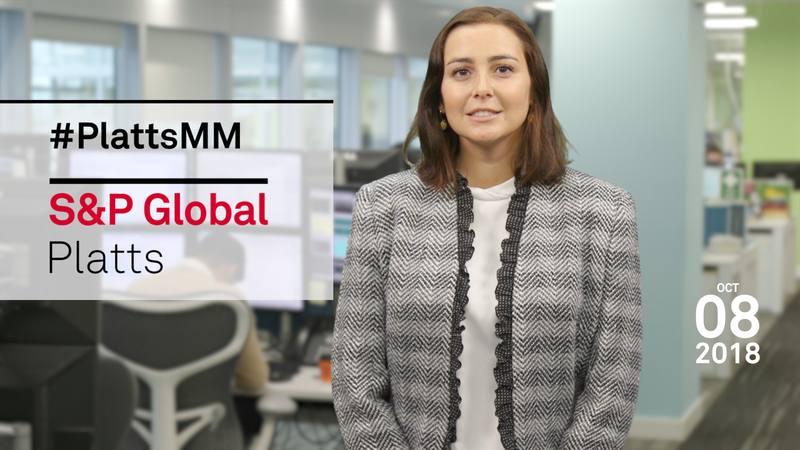 In this week's Market Movers: the global metals industry will descend on London for one of the industry's biggest annual gatherings: LME Week. The event, organized by the London Metal Exchange, kicks off with a day-long seminar featuring a keynote address by Trafigura CEO Jeremy Weir. There will also be panel discussions on the impact of sanctions and tariffs. This is the focus of this week's social media question: Do you expect 2019 to be better or worse for the metals industry? Tweet us your thoughts with the hashtag #PlattsMM. Also taking place in London this week is the Oil & Money conference, which starts on Tuesday. Executives of oil companies and trading houses, as well as OPEC Secretary General Mohammed Barkindo, will congregate in London to discuss the new energy landscape. Staying with political hot potatoes, the UK's Cuadrilla Resources is to begin fracking for shale gas in Northwest England this week. It's the first activity of its kind in the UK since 2011. National Grid publishes its Winter Outlook Thursday. The UK's new belt-and-braces Capacity Market likely to afford the transmission system operator a considerable level of comfort for the season. Finally, in the grains market, all eyes will be on the US Department of Agriculture's World Agricultural Supply and Demand report, expected Thursday. In this week's highlights: London braces itself for a week of metals, money and oil; traders will be watching for key reports from the IEA and US Department of Agriculture; and fracking is set to restart in the UK. This week, the global metals industry will descend on London for one of the industry's biggest annual gatherings: LME Week. The event, organized by the London Metal Exchange, kicks off with a day-long seminar featuring a keynote address by Trafigura CEO Jeremy Weir. There will also be panel discussions on the impact of sanctions and tariffs, responsible sourcing in metals and China's economic outlook. Networking opportunities feature prominently throughout the week, including our own reception Monday night at the Churchill War Rooms – a historic underground bunker used to shelter the UK cabinet from bombing raids. Some executives may already be feeling a sense of the wartime spirit. Our social media question this week is: Do you expect 2019 to be better or worse for the metals industry? Tweet us your thoughts with the hashtag #PlattsMM. Also taking place in London this week is the Oil & Money conference, which starts on Tuesday. Executives of oil companies and trading houses, as well as OPEC Secretary General Mohammed Barkindo, will congregate in London to discuss the new energy landscape. US sanctions on Iran and the recent, rapid rise in the price of crude oil are sure to dominate discussions. Another key topic will be the prospects of increased spending by oil majors. The will be represented this year by Total CEO Patrick Pouyanne and his BP counterpart Bob Dudley. The head of Libya's National Oil Company, Mustafa Sanalla, will give his perspective, following a recent recovery in output from his war-torn country. Also among the speakers due at the Oil & Money event is Fatih Birol, the executive director of the International Energy Agency. Birol's organization releases its closely watched monthly oil market report Friday. The report will be closely scrutinized given the looming Iran sanctions and rising concern among politicians about the effect on prices. Staying with political hot potatoes, the UK's Cuadrilla Resources is to begin fracking for shale gas in Northwest England this week. It's the first activity of its kind in the UK since 2011. The use of fracking has been politically controversial because of fears of minor earthquakes and water contamination, but the UK is increasingly dependent on gas imports. Cuadrilla and its peers say shale gas can go some way to reducing that dependence. The company expects to be able to come up with an assessment of the recoverable reserves at the site in the first quarter of 2019. And talking of UK energy security, National Grid publishes its Winter Outlook Thursday. The UK's new belt-and-braces Capacity Market likely to afford the transmission system operator a considerable level of comfort for the season. Delivery of the first four-year ahead Capacity Market auction began October 1, with 49 gigawatts of generation capacity now being paid to ensure security of supply during peak winter periods. Add a further 6 gigawatts signed up in a top-up auction earlier this year, and a degree of fully justified smugness can be expected from our friends in the control room. However, the cost to the consumer -- at around a billion pounds -- might seem a little high.